There's always gonna be obstacles. obstacles determine where you go. Yesterday evening, as I struggled in the snail-paced rush-hour traffic to the other side of the town, I quietly wondered if the lecture I was heading to really would be worth the tedious effort. It was, every minute of it. Pearl Fryar, the 70-year old self-taught master of artful topiary, spoke about his life and garden, and as he spoke, he proved to be just as much of a philosopher as a gardener. Pearl Fryar's garden, photo by Erica Glasener. Coming from a poor family, Pearl told how he seldom was able follow on the school field trips, as he could not afford the 25 cents needed for the transport. But he never let those circumstances hinder himself from trying hard to get what he wanted, ending up with a good job and house with a garden for his own family. In 1984, he began to work with his 3 acre garden trying to win the local "Yard of the Month" competition of his hometown, Bishopville, South Carolina. 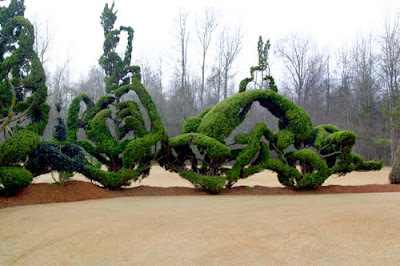 A topiary sculpture by Pearl Fryar, from Tales of the Microbial Laboratory. Pearl knew nothing at all about gardening when he started, so he didn't have any limitations or expectations about what would be or not be possible. 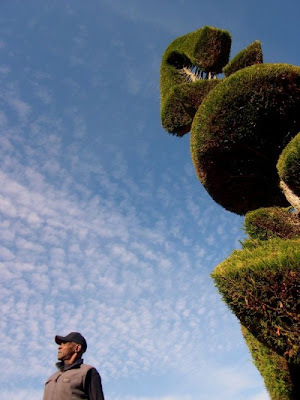 He rescued some half dying plants from the local nursery, and off he went, arguably creating some of the most incredible topiary in the world, with wildly sculptural, almost extraterrestrial forms reminding of both Dr. Seuss and Salvador Dali, combined. As Pearl described his work, it "flew from him naturally", and he just felt where the forms of the plants would go. He talked about his love to seeing other peoples gardens as they always are an expression of the creativity flowing from the person gardening in them. I would have loved to ask him what his garden tells about him with its laboriously cut and shaped forms, but being paralyzingly shy for asking questions in front of crowds, I unfortunately don't have an answer. 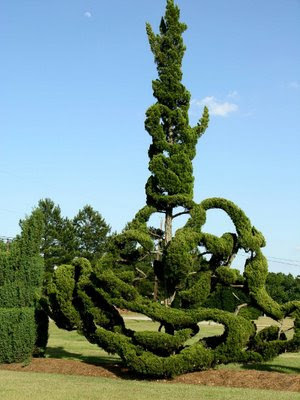 Topiary sculpture, photo by Erica Glasener. Since starting his garden, Pearl has become something of a celebrity, and several newspapers and gardening magazines have pictured his work. Also, a documentary "A man named Pearl" was done for two years ago, telling Pearl's story from the early days as a sharecropper's son to the celebrated cultural icon of his hometown that he is today. The Garden Conservancy has now included Pearl's garden into its protected gardens, working on preserving the garden to the future generations; an amazing journey for a man who just wanted to win the local "Yard of the year" competition. At the end of his presentation Pearl told that he gardens with a purpose: he sees his garden not only as an artwork, but as a tool to learn the unprivileged young kids of today about his life's philosophy of never giving up. As he said, "you have to think and and positive, 'cause negative thinking has never led to positive results." If he could beat the odds of a poor childhood, anybody can; "If people see you trying hard to achieve something, sooner or later some of them are bound to try to help you." And couldn't agree more with him, leaving the lecture feeling warmly and deeply touched by Pearl and his wonderfully eccentric topiary garden that is a living testament to his philosophy in life. 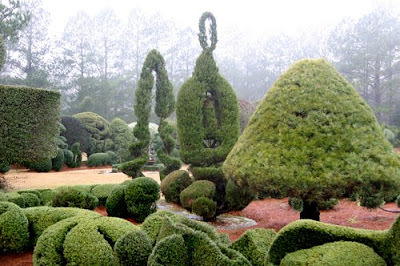 Pearl Fryar's Topiary Garden, official website. A visit to Pearl Fryar's garden, a blog post by Tales of the Microbial Laboratory, with excellent pictures. The first picture is from a postcard given out by Pearl at the lecture. Ja, här försöker jag få till någorlunda runda buxbomklat... Vad kan man säga om dessa konstfulla buskar - lekfulla och kul, och samtidigt nästan lite utomjordiska. Those are some cool topiary! To think he started by just wanting to win a yard contest. Truly a hidden talent. Förstår att det var en väldigt intressant föreläsning! Vad synd att du inte ställde din fråga. Det hade varit intressant att få svaret efter att ha sett hans konstverk. Trots att jag inte gillar dem, tycker jag ändå, att det är rätt och beundransvärt att gå sin egen väg! Great post! I would guess many gardeners cultivate a good bit of philosophy too. Oh, I know what you mean about being timid in a crowd ... hard to ask questions. Mr. Pearl Fryar's garden sure speaks to me and tells me the creator is an exceptionally imaginative artist and perhaps a person who desires to create his own world order ... in a garden that is... a bit controlling in an off the cuff way. But then aren't all gardeners! I love the movement in his work... usually topiary is very static to me. I see the possible Gaudi influence too. I wonder if he ever worked in clay?He surely is inspiring to all no matter their background. Thanks for the introduction!! The landscape gardening of the scene is really solemn.